Two Colorado legislators who supported stricter gun control laws lost their jobs on Tuesday in an unprecedented recall election that became the center of the national debate over regulating firearms. Senate President John Morse and Sen. Angela Giron were both defeated, the Denver Post reported, in the recall effort, which served as a referendum on their support in passing legislation requiring universal background checks on private gun sales and restricting large-capacity ammunition magazines following last year's shooting massacre at a movie theater in Aurora, Colo.
Those bills were signed into law by Democratic Gov. John Hickenlooper in March, eight months after the movie theater massacre in Aurora, Colo., and nearly three months after the classroom murders in Newtown, Conn. The recall election — the first in the state’s history — inflamed legions of gun-rights activists who say the bills ran counter to Colorado’s entrenched Second Amendment tradition. The special elections drew players from both sides of the heated debate over guns in America, with the National Rifle Association and New York City Mayor Michael Bloomberg, a staunch proponent of gun-control laws, throwing their weight behind pro- and anti-recall efforts. Contributions to Morse and Giron totaled roughly $3 million, eclipsing the sum raised by gun-rights activists who loudly lobbied for the senators’ ouster, though some independent groups weren’t required to report spending, according to the Associated Press. The NRA, for its part, contributed roughly $500,000 for "independent expenditures" related to recall efforts, spokesman Andrew Arulanandam told NBC News. Bloomberg, meanwhile, offered up more than $300,000 to the anti-recall campaign, according to the AP. A spokesperson for Bloomberg's office was not immediately available Tuesday to confirm that figure to NBC News. Giron, who was first elected in 2010 in the largely Democratic district of Pueblo and oversaw the Senate committee that first signed off on the background checks measure, decried the recall efforts and pledged to continue serving her constituents. Giron ran against George Rivera, a retired deputy police chief from Pueblo. Morse, who was first elected to the Senate in 2006 after defeating a Republican incumbent in the hotly contested district of Colorado Springs, said he had "no doubt this election is going to be close." 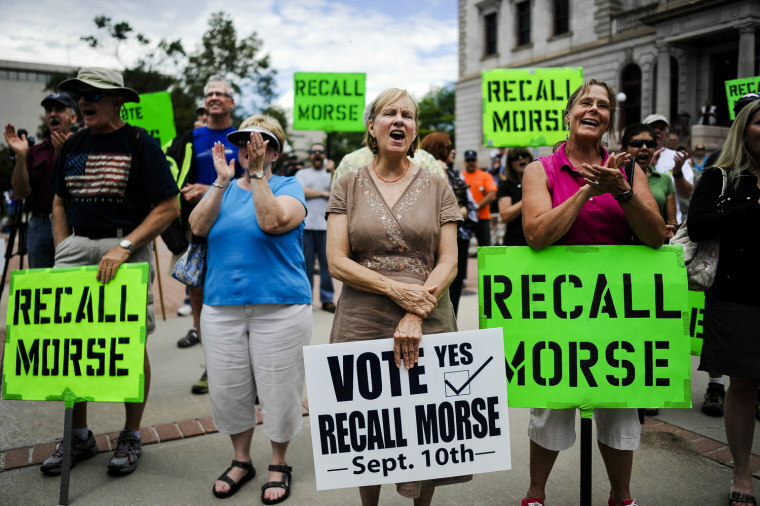 "From the start of this divisive and costly recall, outside groups and a vocal minority have distorted my positions and done all they can to confuse and suppress voters," Morse said in a statement provided to NBC News. "But we've run a strong grassroots campaign and I have been going door to door talking to my constituents for months." Morse's term was slated to expire in 2014, and he has vowed that he plans to seek no other political office, according to the AP. He ran against Bernie Herpin, a one-time Colorado Springs city councilman. Although Morse, a former police chief from the city of Fountain, heads the state Senate, Tuesday's contests did not affect partisan command of the legislature. Even though both Morse and Giron lost their seats, Democrats still control the Senate 18-17. One of the activists who spearheaded the recall campaign, Timothy Knight, told NBC News that he and other recall boosters were indignant that the lawmakers allegedly put a lid on the debate on gun legislation and appeared more willing to take political and policy direction from the President Barack Obama's administration. "If they'd let the people speak, I think these recalls never would've gotten traction," he said. The NRA and conservative groups originally aimed to recall four Democratic lawmakers but were only able to gather enough petition signatures for Morse and Giron. Many voters Tuesday on both sides of the issue said they were motivated to go to the polls to prevent outside influences from making any decisions for Colorado voters. "This recall was so unnecessary," said Julie Beaman as she left a polling place in Colorado Springs on Tuesday. "I don't want to see that happen in the state of Colorado. I love this state and I don't want to see it bought and sold by special interest groups." Carolyne Merchent, who voted to recall Morse, said she also showed up to the polls to temper the impact of those outside the state. "A lot of outside influence is influencing this election instead of the constituents of Colorado.... I would like to see Colorado take charge of the state of Colorado and not special interests," she said. NBC News' Domenico Montanaro, Chuck Todd and Mark Stevenson, and The Associated Press, contributed to this report.